The Triton Aqua Pump Pro is specially designed for the removal of ground water from basement cavity drain membrane systems. 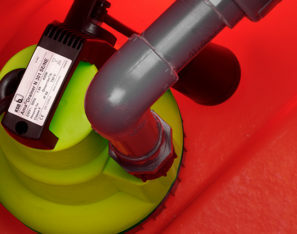 Comprising polyethylene sump, locking access cover and a powerful submersible pump, the system is very versatile enabling installers to locate inlets to their specifications. 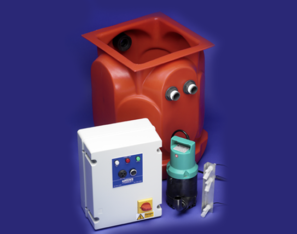 The Aqua Pump Pro Battery Back Up system comprises a polyethylene sump, locking access cover, powerful submersible pump, 24v back up pump and control panel. 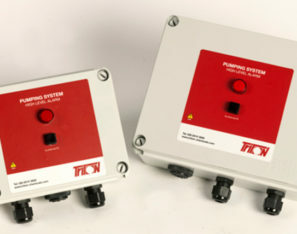 It is designed for use where primary pump failure through mechanical fault of loss of mains power would be catastrophic. The Triton Aqua Pump XL kit can be specified for where a greater ingress of water is anticipated, where there is a greater depth to the basement or to enable the number of pumps to be reduced. 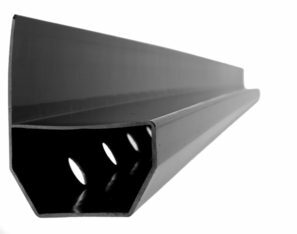 Triton Aqua Channel is a PVC drainage conduit designed to control water ingress in below ground situations. It is fitted around the perimeter of the floor at the vulnerable wall/floor junction and is particularly suited for use in conjunction with Isola Platon cavity drain membranes. Water entering the building through the walls is controlled behind the Platon membrane, and diverted down to the Aqua Channel at the base of the wall. 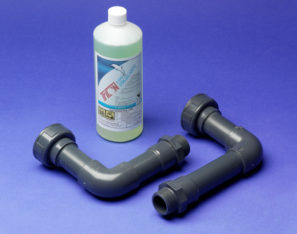 The water enters the Aqua Channel through pre-drilled drainage holes and must then be diverted to a suitable drainage point, either natural, or a sump and mechanical pump. As a general rule a minimum of one sump/discharge point is required for every 50 linear metre run of Triton Aqua Channel. In accordance with BS 8102 (2009), Type C drained protection systems should be maintained. The service period, usually every 6 – 12 months, should be agreed at the outset with the installing contractor or a specialist pump servicing company. Triton can provide details of suitable companies on request. 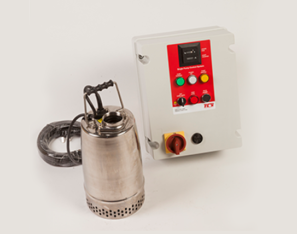 Triton offers a range of mains and battery powered high level water alarms as well as control and monitoring panels for all configurations of pump kit. The Triton Universal Monitor is designed to give additional protection against the risks of flooding where a pumping station is used to de-water a cavity drainage system. 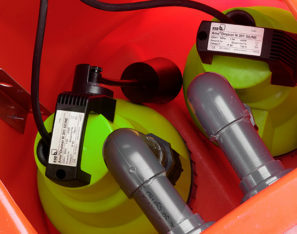 Available in wired or wireless versions, the internet connection allows real time monitoring of water levels and pump operation on a phone, tablet or PC. For use in domestic or commercial basements.